Looking for things to do in Maine? In addition to our craft beers and culinary delights, our Maine Vineyards and their wines are a must try when visiting. I know, when you think Maine, “wine tour” isn’t the first thing that comes to mind. However, a growing number of vineyards and cellars are popping up all over the state and they’re making some really delicious wines. These wine entrepreneurs have discovered that our mild ocean climate lends itself to growing grapes. This burgeoning industry has gone from strength to strength over the last 20 years. For a long time, wines made with blueberries, pears and apples were predominately produced here in Maine. With the development of new grape varieties more suited to our climate, we are now growing grapes for producing Chardonnay’s, Shiraz’s, Merlot’s and other ‘traditional’ wines. 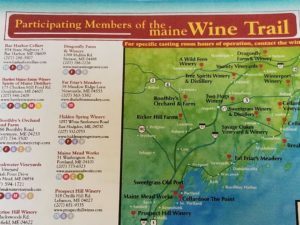 The Maine Wine Trail map has a wide range of participating vineyards and is a great resource for those who want to taste their way up the coast of Maine. These wine producers range in size from the popular and well known to small, family owned vineyards and farms. The Cellardoor Winery is perhaps the biggest, best known, and widely distributed, wine maker in Maine. The vineyard itself is called the Farmhouse and is located in Lincolnville, a short drive from Camden. They have a large selection of Reds including a “to die for” Pinot Noir. Their Zinfandel is particularly nice while sitting outside on our porch enjoying a Maine coast afternoon. Their Sauvignon Blanc is another favorite. We haven’t tried their Vendange yet (a sparkling Rose) or the Treasure, a wild Maine Blueberry dessert wine…..but we’ll get to them soon. You can taste their wines at the Farmhouse, at The Villa in Rockland and at their recently opened Cellardoor at the Point in Portland. There’s several other locations for tasting and buying Maine wines that are only a short drive from Kennebunkport. The Maine Mead Works in Portland is not a ‘classic’ winemaker, but they do have an interesting selection of Meads on offer. Their products include a Dry and a Semi-Sweet variety. They offer Blueberry and Lavendar Meads that are available year around as well. Their seasonal varieties include a strawberry, apple and cranberry. 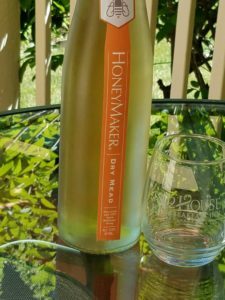 Mead is somewhat of an acquired taste, and not for all, but worth giving it a try when you are in the area. They also make a Hard Apple Cider from Maine apples that is really nice. Their tasting room is open seven days a week and you can order bottles of Mead from their website to ship right to your home. The Sweetgrass Farm Winery and Distillery offer a really interesting selection of wines and spirits. Their farm is located in Union, a short drive from Rockland. The farm is open everyday from May 1st – New Year’s eve for tasting and purchasing their products. You can also watch the wine making and distilling happen. Their spirits include their award winning Back River Gin, an Apple Brandy, single malt Whisky, Hard Apple Cider and a Pure Vanilla Extract! If you can’t make it to the farm, they’ve just opened the Old Port Tasting Room and shop at 324 Fore Street in Portland, Maine that’s open year around. Guests of the 1802 House Bed and Breakfast who want to buy a bottle (or two) of wine to enjoy while staying with us don’t have to go far to find Maine wine’s for sale. HB Provisions in Kennebunk’s Lower Village offer a limited selection. Downeast Wines is just the other side of the bridge from Dock Square, and they have a really nice selection to choose from. We’ll supply the glasses. Cheers!